The British economy, still struggling from the aftereffects of the 2008 Global Economic Crisis and financial disaster, now has received another boot in its ribcage. Moody’s, one of the three major credit rating agencies, has cut its assessment of the UK’s sovereign debt form AAA to Aa1. Typical of other policymakers in the advanced economies gripped by a proverbial sovereign debt and economic crisis, Osborne engages in meaningless platitudes and cliches, hoping to restore market confidence shaken by a credit downgrade through the sophistry of political rhetoric. However, a politician’s words cannot on their own transform structural fiscal and economic realities that are driving the global economic crisis and its parallel sovereign debt crisis. Cutting the deficit by a small portion through austerity measures that have thrown the British economy back into recession, which means the economic growth that is essential for the future servicing of the U.K.s massive sovereign debt, is looking increasingly more forlorn a hope, appears to be a dysfunctional remedy at best. In addition, Moody’s rating cut may impose upward pressure on gilt yields, leading to even higher future budgetary deficits. And, with a new Governor soon to take over as head of the Bank of England, it is not certain that the embattled and befuddled British politicians can rely on the nation’s central bank to again become the lender of last resort through the money printing engendered through quantitative easing. Moody’s has done more than just kill the U.K.’s AAA credit rating; it is a reminder of how dire the economic and fiscal situation is in Britain, just as it is in the Eurozone, U.S. and Japan. The ifo index of 7000m German businesses and their perception of business trends registered a decline from 103.2 in July to 102.6 in August. The contraction in business confidence was more than analysts had forecast, and is a sign of growing worry among business decision-makers in Germany as many large markets within the Eurozone for German goods face a profound economic crisis related to the ongoing debt crisis. While Germany remains the largest economy within the Eurozone, the ifo index for Augusts shows that Berlin is not immune to the impact of the worsening Eurozone debt crisis. There are many reasons for worry in Germany. Not only is the European sovereign debt crisis inflicting economic damage; Germany is paying a high fiscal price for being the lender of last result within the Eurozone. German taxpayers are being asked to pick up a major portion of the cost of bailouts for Eurozone economies mired in the debt crisis. A combination of diminished exports to Eurozone members and fiscal damage to Germany’s balance sheet does not bode well for future prospects for Germany’s economy. There is the old story about the boy who cried wolf too often. Similarly, the Eurozone clique of inept politicians continues to parade out “final” Greek bailout deals. The most recent one is a virtual carbon copy of one submitted months ago. It seems to no longer matter. Even the ratings agencies, far more of a lagging than a leading indicator, now understand that all the talk in Brussels of a real solution to the Greek debt crisis that also ring fences the other vulnerable Eurozone economies is just fantasy. The current Eurozone debt crisis is not only an acute economic and debt crisis. It is also political farce, with a heavy dose of irony. The motivation for the creation of the euro was noble; the European continent had ripped itself apart over centuries of internecine warfare, culminating with two world wars in the 20th century had massacred tens of millions of Europeans. What better way to unite Europeans and end this circle of bloodshed than to create a common currency, the euro. That explains how good motivation can lead to very bad ideas. The concept that a common currency can be used by 16 nations with vastly different economic and fiscal policies was sheer folly. The past two years have witnessed the irrationality of this concept. Yet, Eurozone politicians have so much invested in the survival of the euro, they are prepared to defend it to the last European taxpayer. This mantra inevitably means defending the euro to the last German taxpayer. And it now seems that the rulers of Germany recognize that they cannot indefinitely ransom off the financial future of their voters to subsidize the euro and expect to remain in power. Thus, after a series of “final” resolutions to the Greek debt crisis, which were supposed to prevent the sovereign debt contagion spreading to Ireland, Portugal, Spain and Italy (which has clearly not happened) German ruling circles are beginning to raise skepticism over the most recent promises of Greek politicians. This leads to the possibility that eventually the largely German subsidized loans to Athens to stave off bankruptcy may come to an end. Increasingly, there is not only talk from Greece about leaving the Eurozone. There is emerging talk within Germany’s political and financial elites that perhaps the farce of repeated Greek bailouts should end, Athens should default on its debt and be kicked out of the Eurozone. The irony of the situation is that a project intended to end inter-European strife through a common currency has not only proven to be a fiscal and economic disaster for the continent. The crisis is now re-igniting the embers of past conflagrations and hatreds in Europe. An example was the recent front page of a Greek newspaper featuring German Chancellor Angela Merkel wearing a Nazi armband and storm-trooper’s uniform. The increasingly strident comparisons of Merkel with Nazis in the Greek press is a reference to World War II, when Nazi Germany conquered Greece and inflicted a painful three and a half year military occupation of their country. That the euro seems to be failing as a political tool as much as a monetary unit is proof once again that the path to Hell is so often paved with the best of intentions. Another wave of credit downgrades has hit the Eurozone. S & P cut the credit worthiness of several European sovereigns, most conspicuously France, which saw its coveted AAA rating reduced to AA plus. Austria also lost its AAA rating, and Italy was reduced by two notches, now being rated by Standard & Poor’s at BBB plus. Predictably, French Finance Minister Francois Baroin said “It’s not good news, but it’s not a catastrophe.” A statement of self-contradicting spin that will be unlikely to arouse confidence among sovereign wealth funds and private investors. But perhaps most alarmingly, with Germany now the only Eurozone economy retaining a AAA credit rating, and the German economy having contracted in Q4 of 2011, all these downgrades and somber economic trends undermine the supposed savior of the insolvent Eurozone countries, the so-called European Financial Stability Facility. How will the EFSB sell its bonds to generate capital lend to the fiscally most vulnerable members of the Eurozone? Things are looking increasingly gloomy in Europe, with no resolution for the sovereign debt crisis or economic downturn in sight. And yet, the politicos are still banking on the European Central Bank and its printing press as the savior of last result. What a thin reed to base hope of an economic miracle on. All signs point to 2012 witnessing an acceleration of the negative economic and fiscal metrics that plagued advanced and major emerging economies in 2011. In particular, the Eurozone debt crisis, which dramatically worsened in 2011, shows no sign of abating in 2012. A clear indication of this is that Eurozone cheerleaders President Nicolas Sarkozy of France and Chancellor Angela Merkel of Germany, in New Year’s messages, warned that things with respect to the Eurozone crisis will be even more dire in 2012. A sign of how bad things look in Europe is the latest PMI data on European manufacturing, which was continuing to contract towards the tail end of 2011. This all points to a recession. In fact, there is now a clear consensus among economists that the Eurozone will enter a double-dip recession in 2012, if it in fact has not already done so. Clearly, nations such as Greece, Ireland and Portugal are currently in a recession so deep, it meets the definition of a full-blown economic depression. And what about the United States? With 2012 a presidential election year in America, expect the Obama administration to spin economic data seven ways to Sunday in an effort to make things look more rosy. Thus, an unprecedented reduction in the total size of the American work force is twisted into a lowering of the unemployment rate. But such gimmicks will probably become totally inoperative, once the impact of the looming Eurozone recession and banking crisis migrates to American shores. 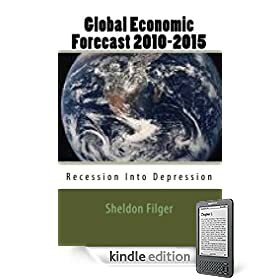 In 2009, in my book , “Global Economic Forecast 2010-2015: Recession Into Depression,” I forecasted that the massive transfer of private debt into public debt by sovereigns as a synchronized response to the global financial and economic crisis unleashed in 2008 by the collapse of Lehman Brothers would fail to resolve the crisis, and would lay the seeds for an even more virulent global economic crisis by 2012. With a global sovereign debt crisis now an established reality, and the Eurozone teetering while America has had its previous AAA credit rating downgraded by at least one major ratings agency, neither a continuation of failed policies nor gimmickry by politicians and central banks will bring an end to the global economic crisis in 2012. Instead of a return to economic growth, the most optimistic forecast one could make is stagnation which, at a time of structural mega-deficits and ballooning national debts, is a guarantee of further long-term economic misery for a great many of the planet’s inhabitants.